Monday, April, 16, 1888 Weather much same till last P.M. clouded over with quite a promise of rain. Others about same. 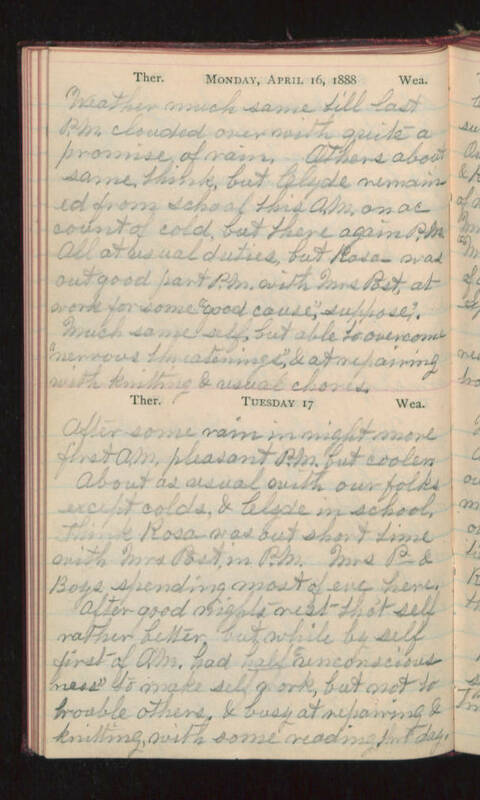 Think, but Clyde remained from school this A.M. on account of cold, but there again P.M. All at usual duties, but Rosa- was out good part P.M. with Mrs Post, at work for some "good cause", suppose? Much same self, but able to overcome "nervous threatenings", & at repairing with knitting & usual chores. Tuesday 17 After some rain in night more first A.M. pleasant P.M. but cooler. About as usual with our folks except colds, & Clyde in school. Think Rosa- was out short time with Mrs Post in P.M. Mrs P- & Boys spending most of eve here. After good nights rest tho't self rather better, but while by self first of A.M. had half "unconsciousness" to make self (?) but not to trouble others, & busy at repairing & knitting, with some reading thro' day.